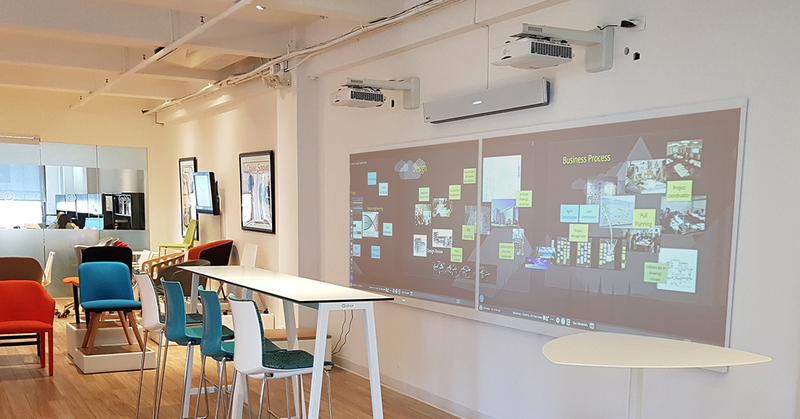 15-foot digital collaboration dual Nureva Wall WM408i system installed at Gordon International showroom in New York Design Center. Gordon International, a resource for high-quality reproductions of early- and mid-20th century classic furniture designs, became the first home of the recently released Nureva Wall with a dual Nureva Wall WM408i system in the New York Design Center in Manhattan. This is Nureva’s first installation of its “next-generation digital collaboration wall” that began shipping during the summer. This third-generation Nureva Wall at Gordon International has replaced the first-generation Nureva Wall, which was one of the first installed when the product was introduced in 2016. Both installations were facilitated by technology consulting firm Phi Services LLC. Teams at Gordon International will use the WM408i Nureva Wall and Span Workspace, the system’s cloud-based visual collaboration service, during client meetings and training sessions, and at events such as first LOOK, New York’s annual contract product showcase for architects, designers and principals. Gordon International designers work with industry professionals in Italy and 20 sales teams across North America to develop new design ideas and bring them to market. The Nureva Wall combined with Span Workspace and the Nureva HDL300 audio conferencing system “make it simpler and faster for these remote teams to work productively together on solutions to design challenges and to visualize their ideas and concepts on the expansive workspace,” according to the Nureva announcement. The WM408i Nureva Wall at Gordon International provides a 15-foot interactive multi-touch surface “that gives teams the room they need to collaborate effectively,” while Span Workspace “lets remote team members participate just as easily from personal devices,” according to the company press release. “Gordon International is at the forefront of furniture design, and we can’t think of a better showroom or location for the first installation of our next-generation Nureva Wall,” said Nureva CEO Nancy Knowlton.